Once again we are here with the Latest News headlines in our today's One Liner GK Current Affairs: 22nd March 2018. All those headlines which are important and can be asked in the upcoming government examinations like IBPS PO, IBPS CLERK, SSC CGL, SSC CHSL and other government examinations have been placed here in single sentences. You can also find a list of Static GK points at the end of this article as bullet points. These are very important for all kinds of examinations and its preparation. 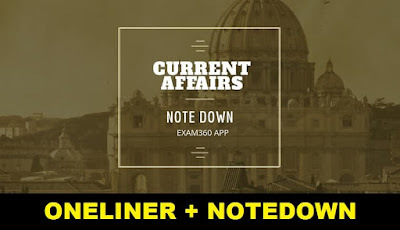 Readers should go through the Daily Current Affairs Quiz and Current Affairs Updates on a regular basis. According to Mercer's annual Quality of Living survey, Austria's capital city Vienna rated the world's most liveable city for the ninth consecutive year by Mercer in its annual Quality of Living survey. German President Frank-Walter Steinmeier will arrive in New Delhi on a five-day visit to India. Kerala has declared Jackfruit as the official fruit of Kerala. Indian Railway Catering and Tourism Corporation (IRCTC) introduced billing through Point of Sale (POS) hand held machines in trains to check overcharging by vendors. The Union Cabinet has approved North East Industrial Development Scheme (NEIDS), 2017 to promote employment in North Eastern Region states including Sikkim. The Union Cabinet has approved the launch of 'Ayushman Bharat' -National Health Protection mission that will provide a cover of 5 lakh rupees per family per year. The NHAI (National Highways Authority of India) pavilion at 105th Indian Science Congress has been adjudged as Best Design Pavilion.